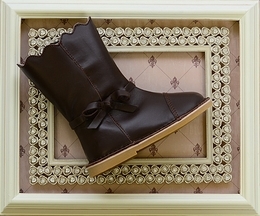 Stylish boots from the Marchita to adorable looks offered in the Petal and Pio Pio shoes for girls. 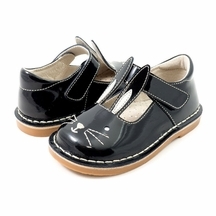 Offering soft quality leather shoes for your little ones feet is a passion for Livie and Luca. Each shoe and boot is handmade offer amazing comfort and durability. I enjoy shopping for shoes for my daughter because they are so small and cute! Everyone knows that children�s shoes are the most crucial part of any of their outfits and no matter how old or young they are: the cuter the shoes, the better the outfit! But I want her shoes to be comfortable, and support the healthful growth of her precious little feet. Livie and Luca have the absolute cutest, and most comfortable shoes for little girls! Whenever I am shopping for shoes for my daughter, I look at them first. Their shoes are super comfortable, versatile, and best of all, durable! From the time my little girl was big enough to wear shoes and walk; she has worn Livie and Luca. The brand captures the childlike innocence that I want my daughter to be able to experience at this time in her life; the whimsical accents and bright colors that go perfectly with all of her outfits make me fall more and more in love with my little girl every day. No matter what season, I know they will have the perfect shoes for my princess. Designed with my child�s busy and active lifestyle in mind they are perfect at creating special occasion and casual shoes that my little girl actually wants to wear. Various different rubber soles help her to remain stable while their foot develops and grows to its full potential! Whenever we have a special occasion, we break out one of her pairs of petal shoes. The creative take on the simple Mary-Jane style of dress shoe looks so sweet and childlike on her tiny feet! We have these shoes in many different colors to go with every single one of her dresses. Some of her pairs of petals have different colors outlining the petal cutouts, and they look just darling! When she dances around in her petal shoes, I can just feel the childlike wonder exuding from her and going out into the world. The shiny leather looks stunning with her fluffy dresses and even some of her more casual outfits. But Livie and Luca is good at making things other than special occasion shoes. Their casual shoes are just as much a constant staple in my daughter�s wardrobe. When we are looking for a more casual Mary-Jane type of shoe my little girl will often wear her precious Pio Pio shoes. I love the little appliques of birds, hedgehogs, and other little woodland motifs. They look so precious with her outfits, especially in the fall and spring. The Palma shoes from the brand are so cute in their bright colors with the ankle straps. They are a trendy new spin on a classic Mary Jane and t-strap shoe. In the warmer months, I absolutely love their sandals! Their Kea sandals are so cute with the peep-toe on the Mary-Jane style. They look so cute with her more formal spring and summer dresses, and I love the little petal cutouts on the back of the heel. The other sandals from the brand are so cute with their little detailed appliques on the strap near the toes. Bows, stars, flowers, and polka dots are some my little girl�s favorite things and we love when they are on her shoes! She can add an extra feminine flair to any of her outfits with a cute pair of shoes. It is so darling when she wears her pretty yellow sandals with jean shorts and a cute tee. One of her favorite pairs of shoes are her bright Nova sandals. The shooting star with its brightly colored, strappy tail incorporated into the strap around her toes is just darling! She loves to wear her Nova sandals when we go on vacation to the beach. They look so sweet when she wears them with her summer outfits or her swimsuit. The bright colors of the sandals just scream summer, and I have to stop her in the winter when she tries to leave the house with them on! Livie and Luca have the cutest boots for the winter and fall seasons. 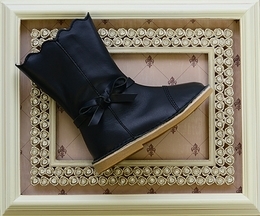 Their tall, leather suede boots coordinate so well with my daughter�s leggings and tunics. They help to keep her little legs warm and her feet comfortable during recess, while still looking chic! They look young and childlike, while allowing her to follow the hottest fashion trends. She loves the button accents that run up the sides of her designer boots, and she loves that the zipper on the side makes the boots easier for her to get on and off herself. The moccasin boot are also some of our favorites. We love the colorful take on the vintage style. She loves to wear her moccasin boots with jeans, and their soft insoles keep her feet comfortable while she plays with her friends. Her Tiempo Boots are super sweet! She loves to wear them with her little jeans, and it always looks adorable! The brightly colored laces really stand out against the darker body of the shoe. Livie and Luca have created shoes that are perfect for children. The soles of every shoe are made of durable and gripping leather to help with stability. Even the dressiest of shoes by the designer are durable to survive the most exciting child�s lifestyle. 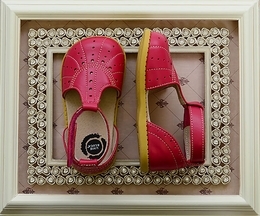 The shoes are meant to create �joyful feet� and every pair of shoes is as unique and special as the child wearing them. Every single shoe from the designer is lightweight, flexible, breathable, functional and expertly detailed to provide wiggle room for your toes and joy for your heart! Their shoes are designed to help a child�s foot grow and develop naturally, so they can continue to live happy, healthy, and fulfilling lives! I love to watch my daughter grow up in her sweet soft leather shoes, and you will love to watch your daughter in hers too!